As we drove into Pearlington, Miss., some semblance of civilization was visible. 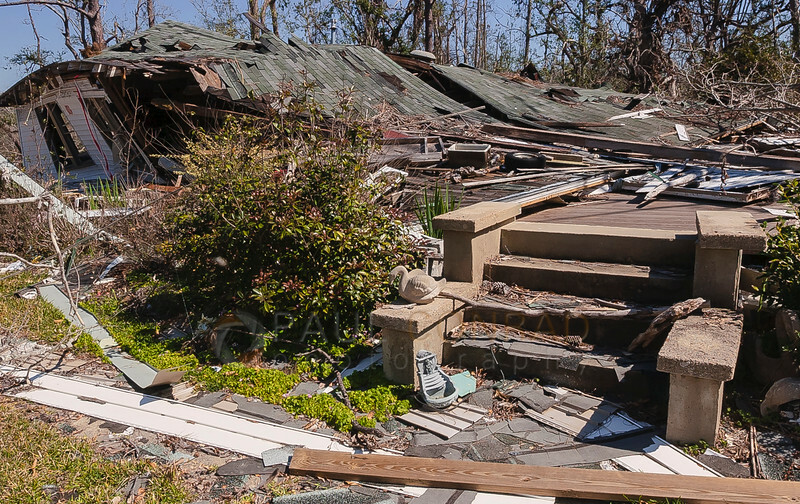 The roads were mostly clear, some homes had been torn down to their foundations, but mostly, there was still homes untouched since Hurricane Katrina decimated the town. 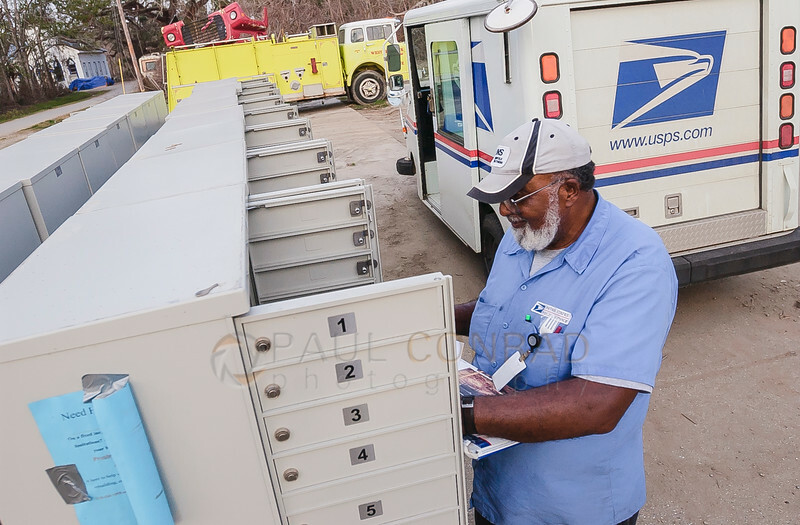 We were shocked to find very little has changed..
Six months after Hurricane Katrina roared through, Aspen Times reporter and I returned to see what the continuing needs were for the town. 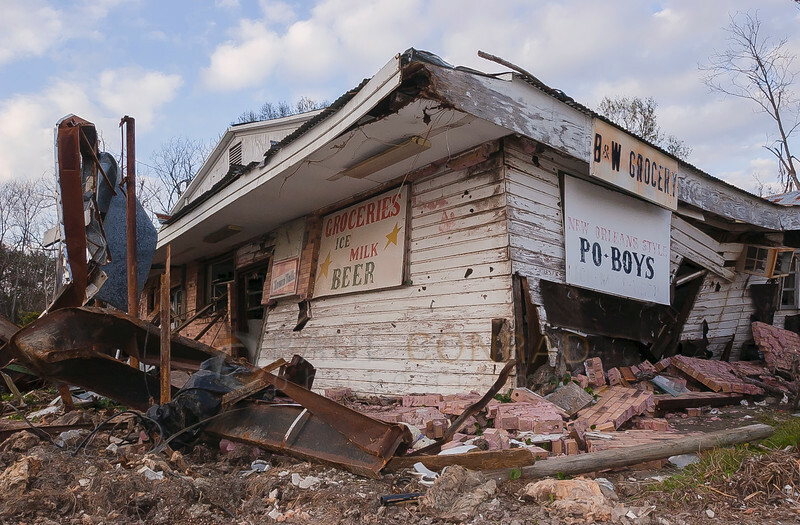 ©Paul Conrad/The Aspen Times – B & W Grocery in Pearlington, Mis., continues to lie in ruins six months after Hurricane Katrina decimated the town. Some basics services such as electricity have been restored, when we were there, a phone company was fixing the phone lines, cell phone service was restored, and most of the streets were cleared, but piles of debris still lined the roads and many homes were still in shambles. There was still a lot of work to do. On a scale of 1 to 10, Pearlington was still a 1. As with the first trip, our first stop was along the main highway to see some of the people we talked with before. While driving through town, it was apparent little progress was made other than the clearing of the streets and very few homes. Many in Pearlington were still waiting for decisions from the insurance companies. 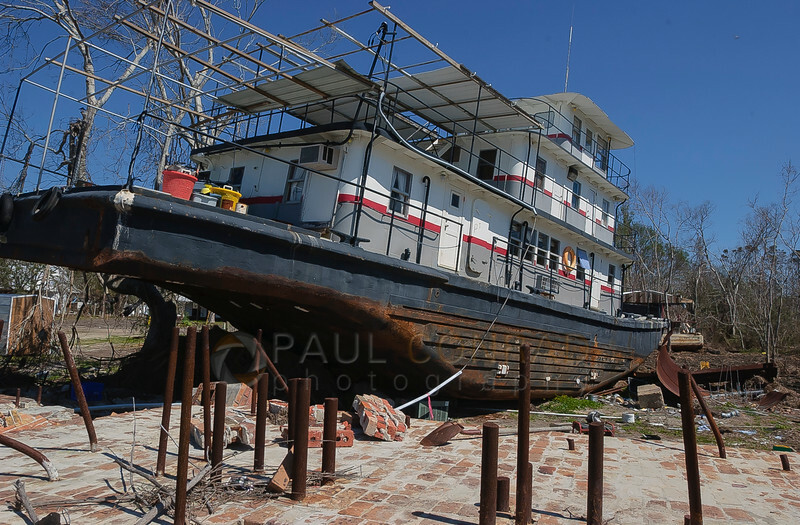 ©Paul Conrad/The Aspen Times – A riverboat remains where the storm surge from Hurricane Katrina left it along the Pearl River on March 4, 2006. The riverboat destroyed the home when the high winds and storm surge broke it from its mooring over a mile down river. There was a permanent smell to the air akin to mold and mildew. It was apparent why. The heat and humidity accentuated the rot of the lumber and debris along the roads and at homesites still untouched since August 29th, 2005, six months earlier. 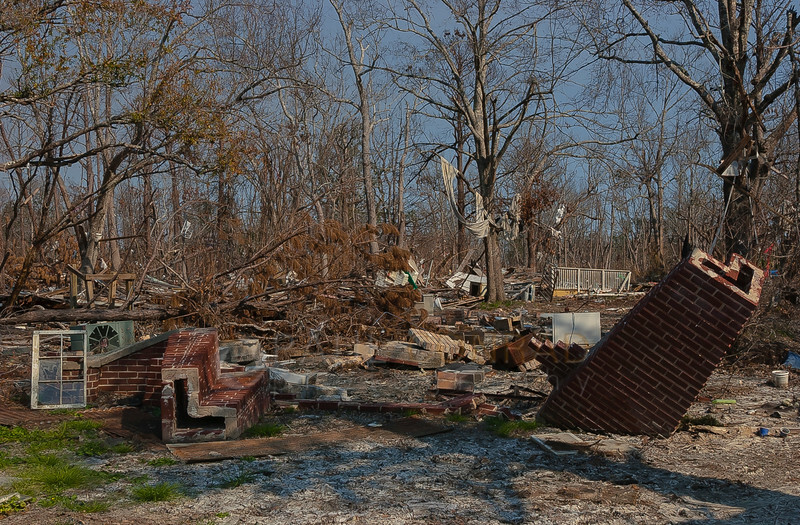 ©Paul Conrad/The Aspen Times – A home in south Pearlington, Miss., remains in ruins on March 4, 2006, six months after Hurricane Katrina decimated the town. During the week, we were in then out of Pearlington, went to Pass Christian, Waveland, and Bay St. Louis. Again, visiting the places we say in Sept. of 2005. 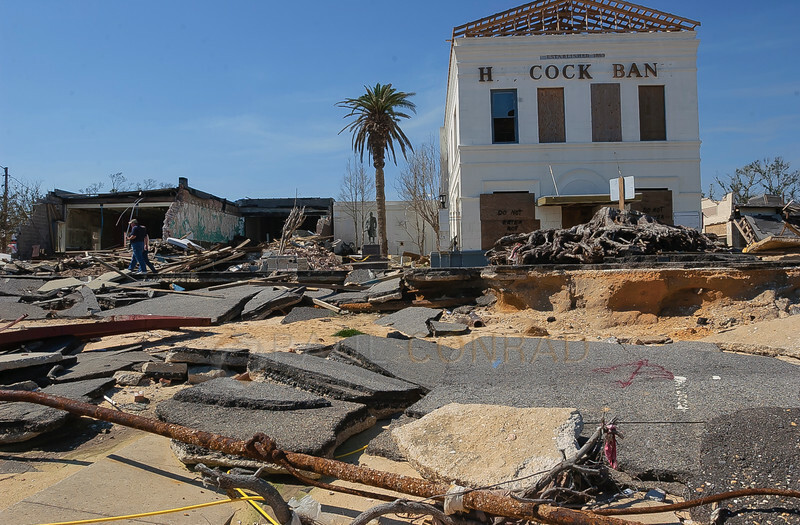 ©Paul Conrad/The Aspen Times – The gutted remains of Hancock Bank along South Beach Boulevard in Bay St. Louis, Miss. ©Paul Conrad/The Aspen Times – Along the waterfront in Pass Christian, Miss., in March of 2006, six month after Hurricane Katrina. Some residents did not wait for FEMA nor the insurance companies to begin the process of rebuilding. Larry Nicosia’s home on Riverfront was wiped out. The only thing left of his were the pilings the home rested on. Many of the residents still relied on the recovery center for their basic supplies. Food, clothing, shelter, were all available to the residents. Charles B. Murphy had been transformed into a fully working center over the past few months. 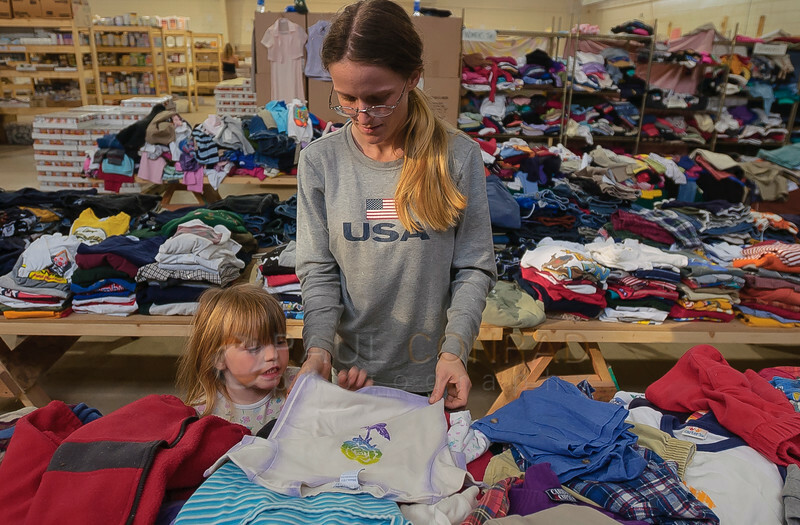 ©Paul Conrad/The Aspen Times – With her 3-year-old daughter Kaitlin Shelton watching with great interest, Katrina Hart of Pearlington, Miss., checks out clothing at the “Pearl*Mart” at the Charles B. Murphy Elementary School relief center Wednesday afternoon March 1, 2006. “We come about once a month to get things we need,” she said. During one afternoon, we filed our photos and stories early. So Scott and I took a break at the Recovery Center. I took that time to wander about and see what I could find in the school. It was apparent someone tried cleaning. The third room, the desks and furniture was piled in a corner and trash on the floor, the walls were cleaned. The fifth room was untouched as were the rest of the rooms in the wing. I continued to walk through and found some incredible things. 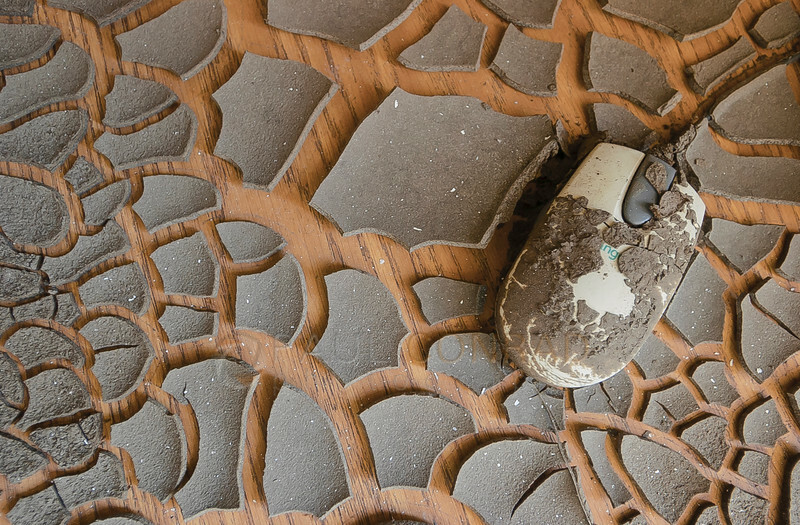 One of my favorite photos is a computer mouse surrounded by dried and cracked mud. 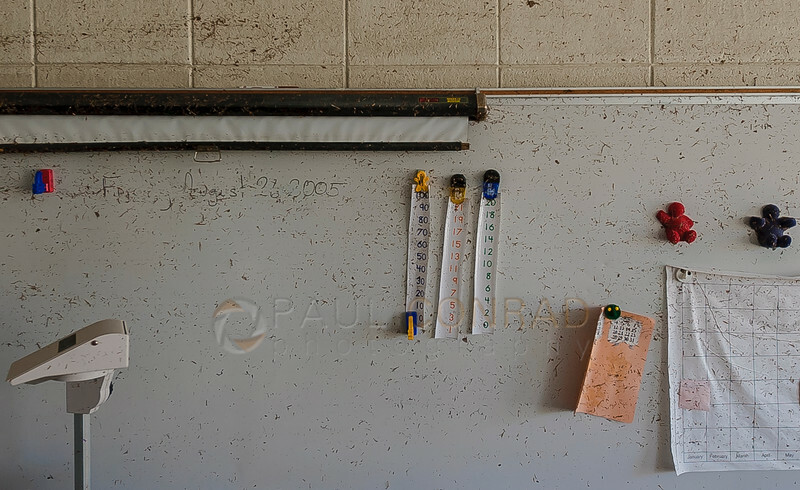 Toys in a kindergarten room, watermarks on the wall showing the level of the storm surge. ©Paul Conrad/The Aspen Times – Muddy Mouse: Cracked mud surrounds a child’s mouse in a classroom of Charles B. Murphy Elementary school in Pearlington, Miss., during a self-tour on March 5, 2006. I spent about 4 hours walking around the school to see the damage Hurricane Katrina did. I found some incredible stuff. 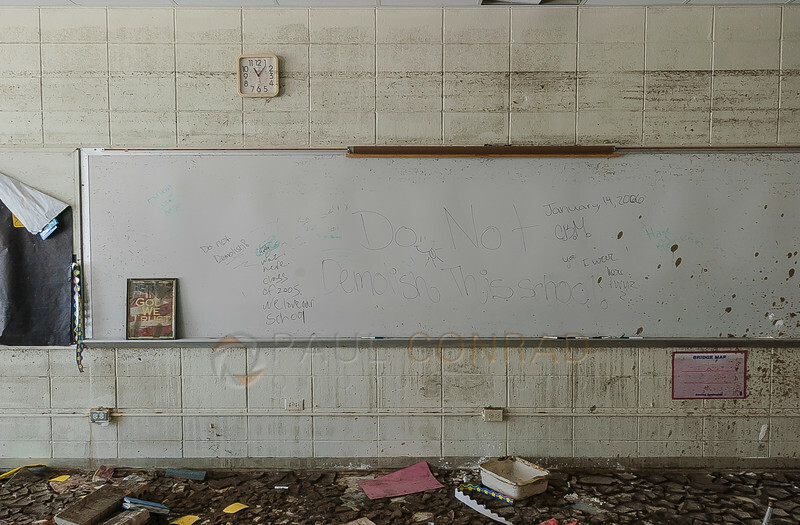 ©Paul Conrad/The Aspen Times – The storm surge from Hurricane Katrina nearly reached the ceiling as evidenced by the water marks in a classroom of Charles B. Murphy Elementary school in Pearlington, Miss., during a self-tour on March 5, 2006. I spent about 4 hours walking around the school to see the damage Hurricane Katrina did. I found some incredible stuff. ©Paul Conrad/The Aspen Times – Today’s Lesson: A lesson plan for Friday August 26, 2005 remains on a dry-erase board in a classroom of Charles B. Murphy Elementary school in Pearlington, Miss., during a self-tour on March 5, 2006. I spent about 4 hours walking around the school to see the damage Hurricane Katrina did. I found some incredible stuff. 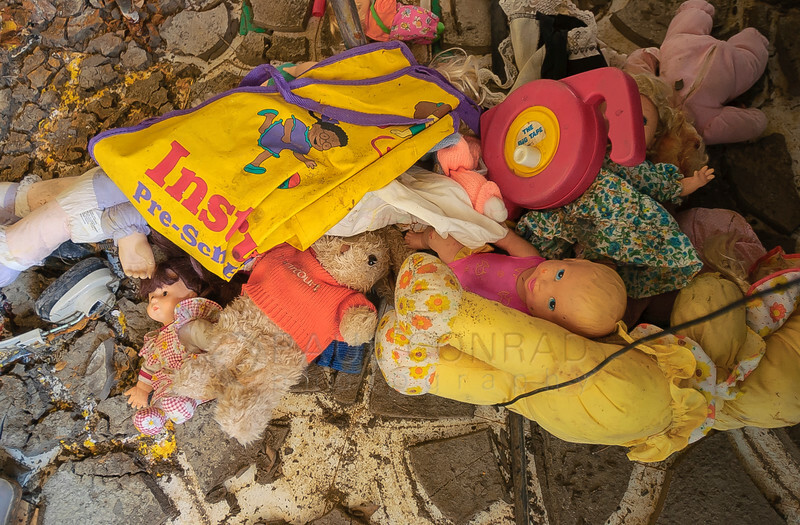 ©Paul Conrad/The Aspen Times – Dolls: The floor of a kindergarten room is littered with dolls and stuffed toys at Charles B. Murphy Elementary school in Pearlington, Miss., during a self-tour on March 5, 2006. I spent about 4 hours walking around the school to see the damage Hurricane Katrina did. I found some incredible stuff. 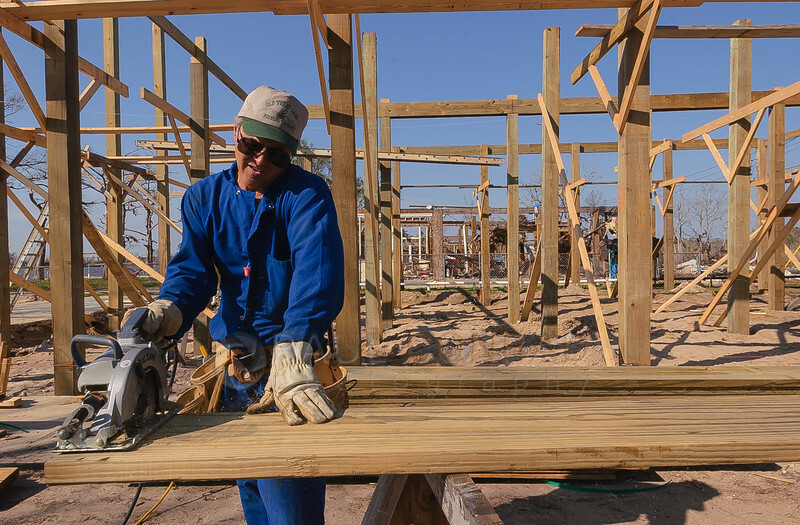 Faith continues to be a big part of the rebuilding process for many. 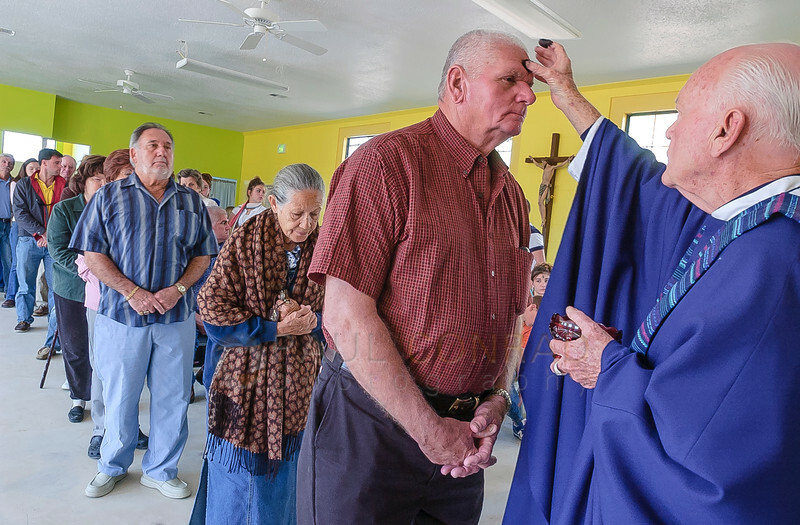 Church services in St. Joseph’s Catholic Church were now being held in the rebuilt community center. It was was being debated whether or not to rebuild the church building. ©Paul Conrad/The Aspen Times – Pearlington, Miss., resident Bubby Lichtenstein gets an ashen cross placed on his forhead by Father Jim O’Bryan during Sunday morning mass at St. Joseph’s Church in Pearlington March 5, 2006. Six months after Hurricane Katrina, the church’s community building has been cleaned, is under going repairs, and is being used for services.